Kitchen and bath remodels are some of the quickest ways to add value — and enjoyment — to your home. You can update floorplans, colors and materials and incorporate new technologies for showering, cooking, cleaning and heating into your home. Kitchen remodels are costly, but the results can be dramatic in terms of appearance and convenience. Many kitchen remodels expand the room, opening walls or even adding space onto the house. According to Shumate, traditional triangle layouts for a sink, refrigerator, and stove, are less common. Her clients are asking for open layouts that integrate the kitchen with the rest of a home. In open kitchens, a large island for cooking and eating overlooks a living or dining area. While all-white kitchens are currently the rage, Shumate expects that to change soon. “We’re seeing more color,” she says, noting that combining white with gray materials is popular. She favors wood cabinetry — not painted, but simply stained to allow the beauty of the natural wood to show through. 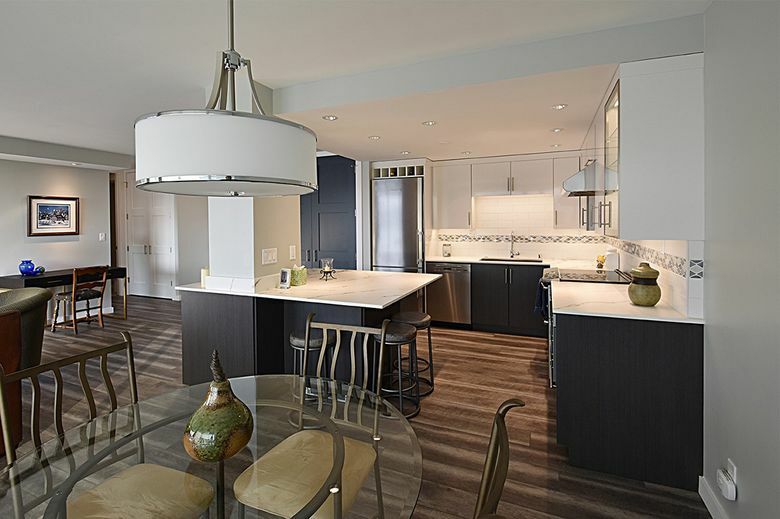 If you’re seeking the modern, uncluttered feel of a European kitchen, Richard Lawrence, marketing manager at Chermack Construction in Edmonds, points to the new Thermafoil cabinets. With a layer of vinyl laminated to engineered wood, Thermafoil provide smooth surfaces that resist chipping. “They’re easier to maintain than painted wood, and you have a wide range of colors and patterned finishes,” Lawrence says. Whatever style you choose, Shumate suggests that you do new cabinets at the same time you install new counters. “It’s very difficult to go back five years later and try to lift a countertop to replace beat-up cabinets underneath,” she says. Today’s bathroom remodels are all about the shower. “The big trend is that people are taking away tubs because they want the space for two-person showers, complete with two showerheads and maybe a bench,” Shumate says. The new showers present a number of design choices. 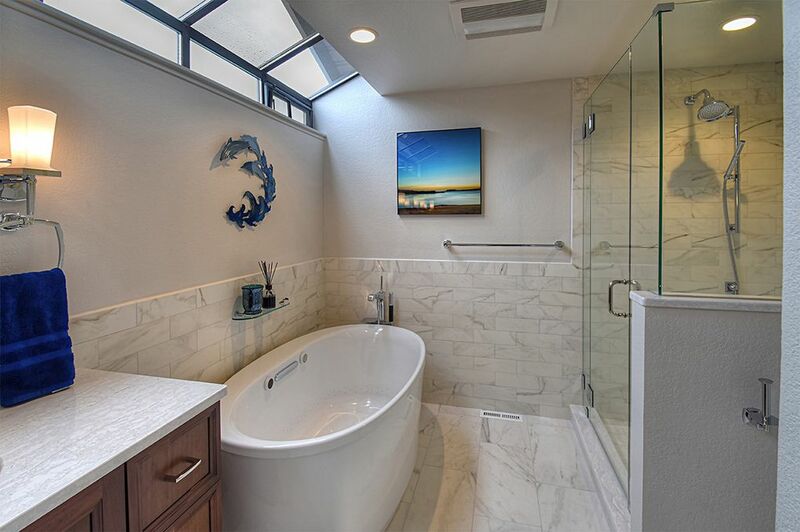 Do you want a walk-in shower, curbless and tucked around a corner so you don’t even need a shower door? Or do you want a steam shower, tiled to the ceiling with a door to keep that luxurious steam inside with you? “The steam showers require a little extra plumbing and electrical, but the effect is magnificent,” Shumate says. Want to make your new bathroom really special? Shumate loves the new “laminar flow” faucets, which reduces splash and spatter in the shallower vessel sinks. Shumate advises working closely with a designer for kitchen and bath remodels to get the inside story about products and brands, including products that might be available only from specialty stores and manufacturers. “The designer’s job is to know what’s out there, and where to find it,” Shumate says. Visiting the Seattle Home Show is a great way to get ideas, see new products in person and talk with experts about design and installation. Considering getting financing for some or all of your remodel? Aaron Bresko, senior vice president of consumer lending at BECU recommends looking into a home equity line of credit. The Seattle Home Show Feb. 23 – March 3 at Century Field features many ideas and solutions for your kitchen or bath remodel.